It’s spring! Rhubarb and the first strawberries of the year are at the Farmer’s market! So I’ve just GOT TO make a strawberry-rhubarb pie! Which recipe will I use? My own of course, but can I really call it my own creation after all it originated as a Rhubarb pie from a Martha Stewart recipe? I was re-reading a post from Diane Jacob’s excellent and informative blog, Will Write for Food about the controversial issue of calling a recipe ones own. Most recipes aren’t ever truly original. 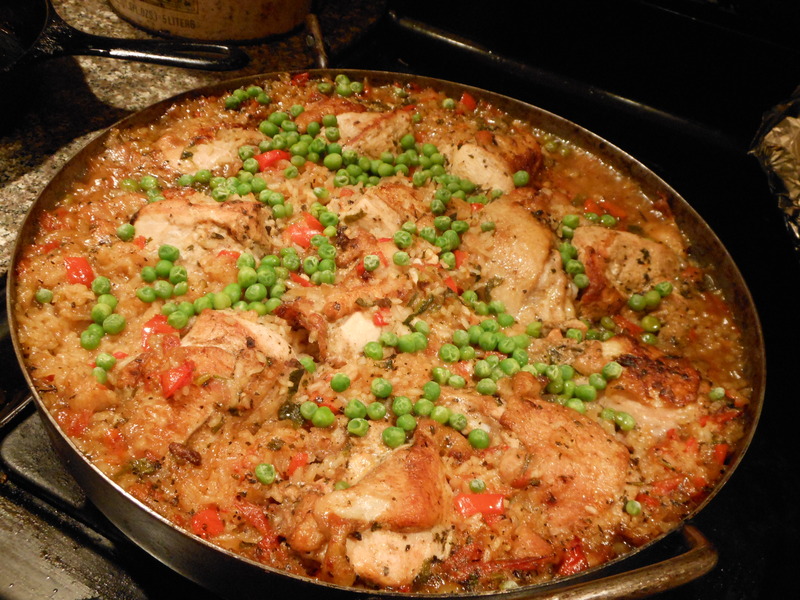 Does adapting a recipe make it possible to lay claim to it? Some people feel that if there are three ingredients/measurement changes and the recipe is not copied verbatim from the original then it’s fair game to claim it as their own. 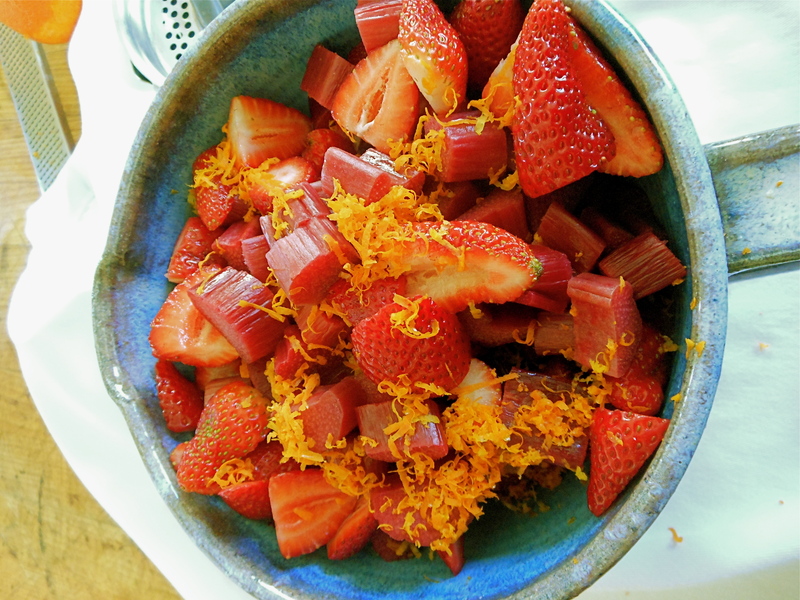 My changes included the addition of strawberries and a change from orange to Minneola tangerines. My measurements were more specific and the amount of flour, cardamom and type of juice and rind were changed to fit my taste. Other folks say to give acknowledgement to the originator. 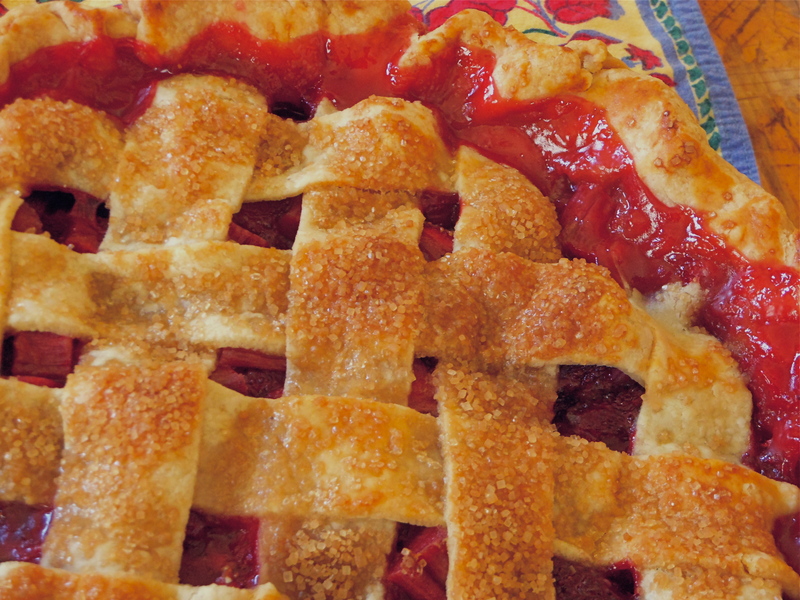 So with all this in mind I will state that my Strawberry Rhubarb pie is adapted from Martha Stewart’s Tartan Rhubarb Pie and leave it at that. You can check out her recipe and compare the changes I’ve made. Now that we’re done with that,” Ladies and Gentlemen, FIRE UP your oven, GET OUT your rolling pin and START baking ! 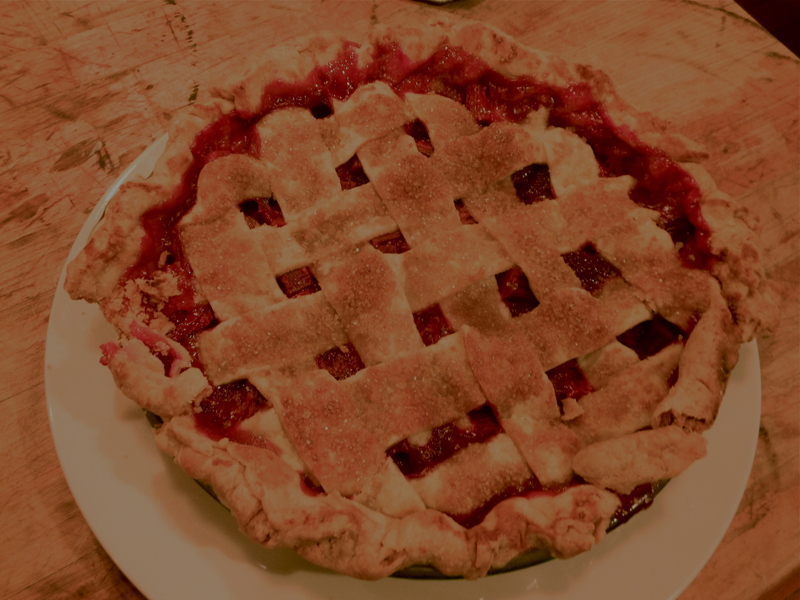 Cause this pie will get you out of your winter hibernation and jumpstart your Spring !! 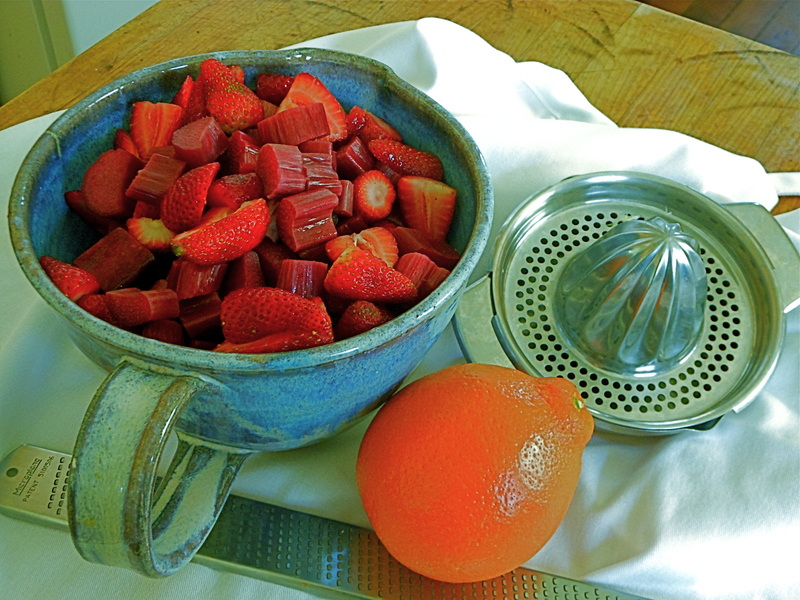 Combine strawberries with rhubarb. Add sugar, tangerine rind, juice and , cardamom. Let sit for 5 minutes. Add flour to fruit mixture and toss until incorporated. Let sit for 5 more minutes. Roll out bottom crust and lay this into the pie pan. Fill with fruit mixture. Roll out second pie dough and cut into 1-½ inch wide strips. Lay half of the strips across the top of pie. Weave the remaining dough strips over and under the first strips. Roll the dough from strips and bottom crust together to form a rim. Crimp crust together and attach parts to pie pan. Brush the top piecrust with some milk or cream and sprinkle some coarse sugar or white sugar on top. Bake for 60-75 minutes until the juices are bubbling CLEAR red. ** Preheating the cookie sheet before placing the pie on top will insure that your bottom crust will be crispy. I’m Back !!! I’ve officially retired from teaching in the classroom. After twenty years teaching kids with learning needs it was time to strike out and spend more time on following my other bliss, writing, cooking, creating new recipes. So many projects, so little time and as I entered my 65th year of life I wanted to make sure I got a couple of these projects done before……… So first on the list was to make a list, prioritize and set goals. Got my private practice as a Learning specialist started. Next was to self publish my book “Tasting Life” a collection of food stories, poems and recipes. ** Shameless promoting but that’s what old ladies can get away with these days. Got that done. Now finally, I have the time to work on completing my cookbook and attending to my neglected blog. In preparation for retirement Larry and I talked about what I wanted to gain from this decision. One major thing was to get healthier, lose weight, exercise more and have the time to complete my writing projects. As my income would be greatly reduced, we planned how we could live on a smaller budget yet still continue to cook and eat delicious meals as well as entertain our friends. We both agreed that we didn’t want to feel deprived when it came to eating. So we started cooking differently and found that we were able save money, eat more healthfully and continue to enjoy delicious meals. I found to my delight that not only was I losing weight but also I was wasting less food in the process. So here’s one thing I’ve learned so far. Budget and health tip number one. Eat less meat. As a child in a Chinese household, meat was never the main item on the table but was used to accompany vegetables in stir fries. If we did have a roasted chicken, pork or beef we only ate a few pieces alongside the variety of other dishes with vegetables on the table. Back then I was much slimmer and healthier. Over the years after leaving my mother’s kitchen I ate more meat, less vegetables and subsequently gained more weight. Now I’m back to cooking in the style of my mother and I’m finally losing weight and feeling way healthier. Last week I bought a whole roasted chicken from Costco for $4.99. 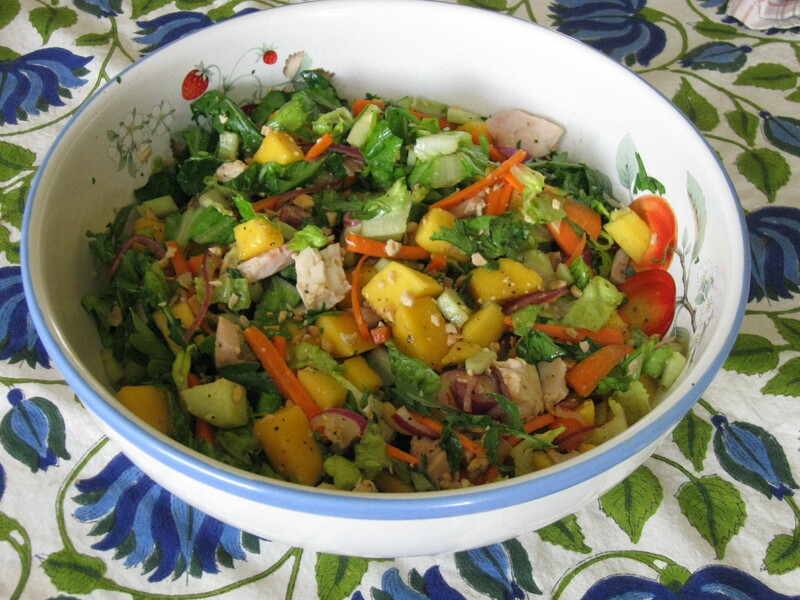 I used just one breast from this roast and made this Southeast Asian chopped salad. Now I’ve got enough leftover meat and bones to make a chicken pot pie for four people, chicken hash for two and enough for curried chicken salad for both of us for lunch. 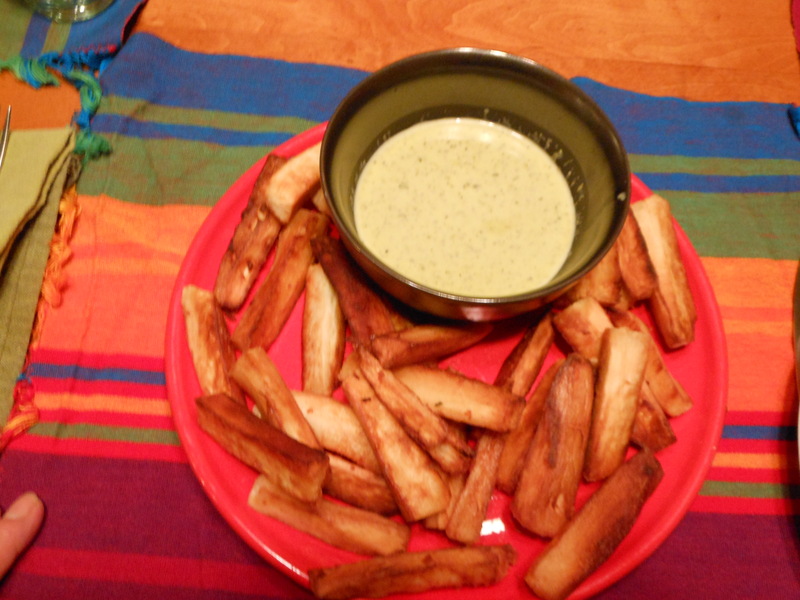 Hmmm, maybe I’ll make some empanadas instead……..
1. 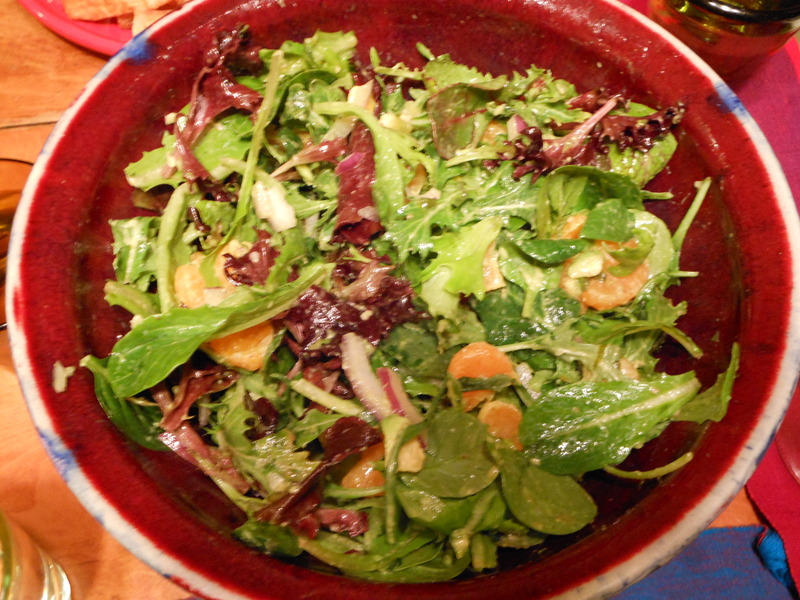 In a large salad bowl, toss lettuce,arugula, onion, carrots and cucumbers together. 2. Peel mango with vegetable peeler. Cut sides and then cube. Cut off any extra meat off seed and use as well. 2. Add the cut up mango pieces with cilantro to salad . 3. Sprinkle lime juice and black pepper over the mango pieces. 3. 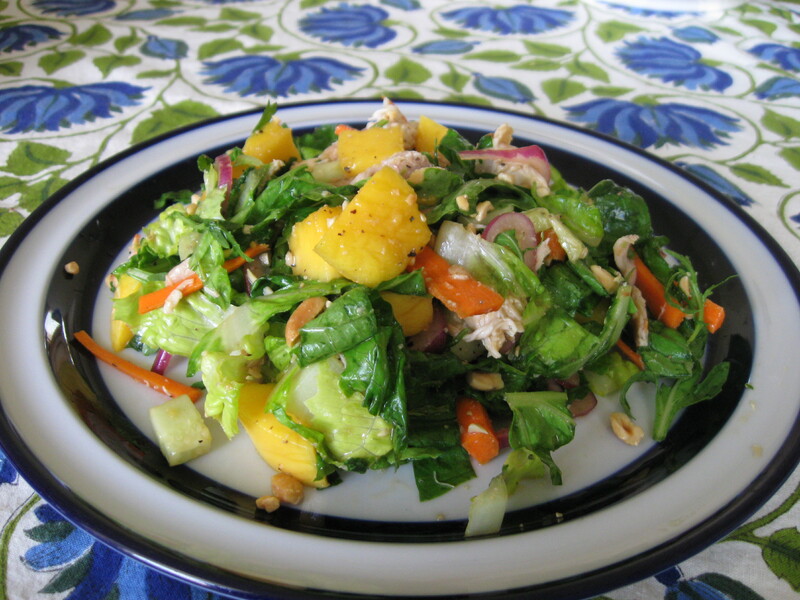 Sprinkle soy sauce, fish sauce over mango, salad and toss together. 4. Add chicken, peanuts and toss again. * I prefer to use the Hayden or Tommy Atkins mangoes. 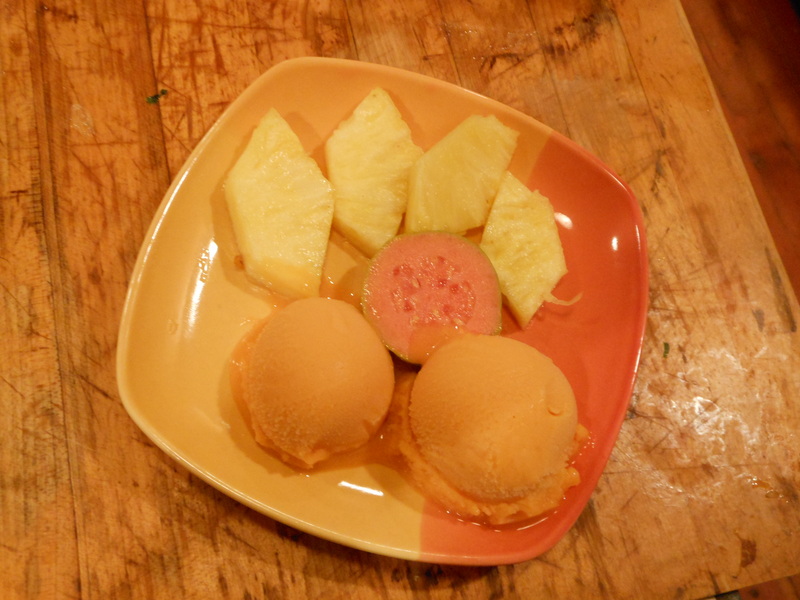 They are firmer than the Manilla type of mangoes and have more meat. ** “Tasting Life” will be available through Amazon in late September.